We're pleased to offer various product displays, to inspire and aid with product selection. Here's an overview of some of the product displays you can expect to see and at which branches to find them. If you're looking to match or select bricks, visit our extensive brick & roof tile showroom at Alton, where you can view a vast number of brick samples from the leading manufacturers. Site visits for brick matches are easily arranged and samples are readily available. Our Bordon branch has a smaller brick display, showing just the bricks that are held in stock at that branch. 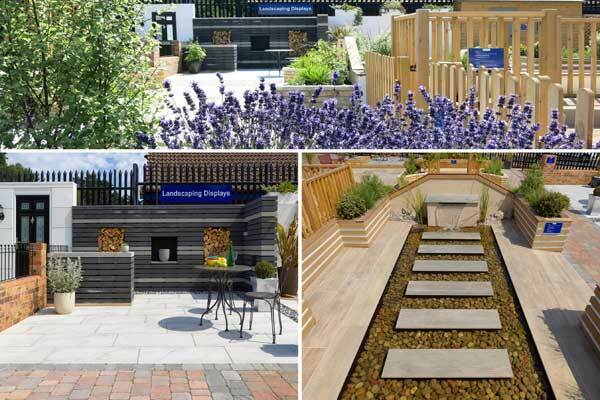 Landscaping Displays: Be inspired by our NEW landscaping display at our Bordon branch, showcasing paving, block paving, walling, composite decking, fencing, artificial grass, decorative stone, sleepers and more ... all in beautiful garden settings. We also have a smaller paving display at our Haslemere branch. Don't forget to pick up colour brochures during your visit too! Landscaping materials on display at Bordon include products from: Pavestone, Bradstone, Tobermore, Acheson + Glover, Millboard, Grange Fencing, Artificial Grass, and Long Rake Spar. 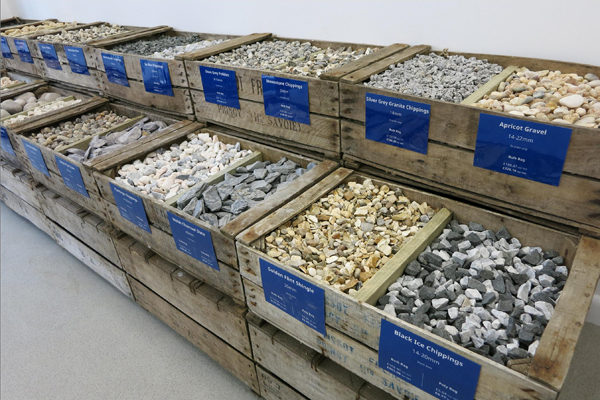 Paving Libraries: All branches have paving libraries, displaying samples of every slab that we hold in stock, so if you need paving in a hurry, you can instantly see what's available for fast free local delivery (on orders over £100 inc VAT). Decorative Stone: At Alton we have a comprehensive indoor display of all the decorative stone that we can supply (both from stock and to order). Meanwhile, at Bordon you'll also find an indoor decorative stone display, whilst at Haslemere there's an outdoor display showing just the decorative stone available from stock. For kitchens, look no further than our award-winning showroom at Bordon. Here you'll find a number of beautiful kitchens on display, as well as taps, sinks, worktops, plus splashback and tile samples. We offer a massive selection of kitchen door styles, so if you don't see the kitchen of your dreams on display, no problem as the choice doesn't end there. Take a look at our kitchen door selector for more choices and pick up brochures instore. We also supply kitchen appliances from some of the leading brands and can arrange kitchen installation if required. 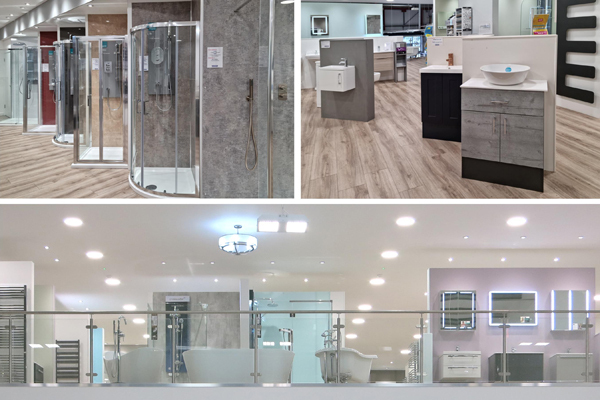 At our Alton and Bordon branches you'll find bathroom showrooms showcasing many of the leading bathroom brands plus taps, tiles, towel rails, accessories and more. Whether you're looking to refurbish a cloakroom or a full bathroom suite - from budget to high end - take a look at our displays and let our experienced bathroom designers help you create the bathroom of your dreams! For disabled access to the showroom, please visit our Alton branch. The hard wearing qualities of wood flooring and vast range of styles make it perfect for any room in the house. 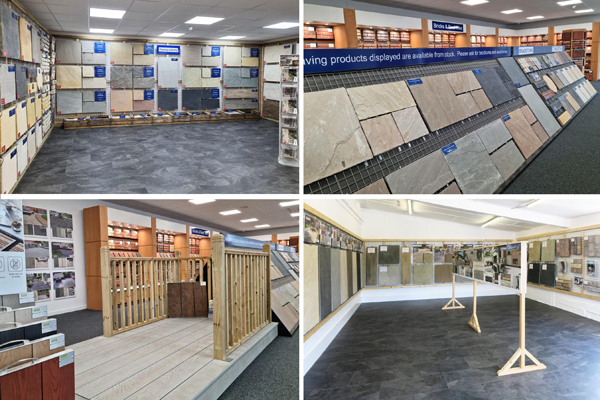 The Wood Flooring Centre at our Haslemere branch has a vast array of sample boards including Kährs and Quick-Step wall galleries. Our staff are here to help advise you on the best type of floor and can even put you in touch with accredited flooring installers if required! We have internal and external doors on display at all branches, with the largest displays being at Alton and Bordon. A range of doors is held in stock and we can order anything from our catalogues, which are available at any branch to take away. So whether you're a homeowner requiring one or more doors or a developer working on a housing project, we can supply all your door requirements ... plus we also stock door furniture for the finishing touch! So whatever your project, call in and browse our specialist product displays and get help and advice from our friendly team!